The cornerstone of today's South African Army was laid in 1912, two years after South Africans 'regained' control of the country since the Anglo Boer War. General Louis Botha was the leader of the country at the time and under General Jan Smuts the spade work was done to establish South Africa's own defence system. 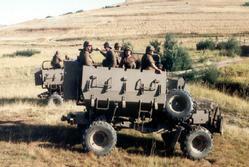 The history of the armoured vehicle in South Africa however started well before 1912, in 1900 the first self-propelled armoured vehicle was used. This was a steel plated monster used by the British in the Boer War and supplied by John Fowler & Company who were the steam vehicle specialists of the time. Typical of the first armoured cars (excluding tanks) the development of these vehicles was based on commercial vehicles, this was the case through to the Second World War until the successes of UNIQUE German Armoured Cars proved their worth. It is also evident from history that it is especially during these years of war that accelerated developments occurred and the real test of the 'soldiers morale and the machines' ability took place. A Major Milestone for Armour in the then Union Defence Force (which became the South African Defence Force which is now a part of the South Africa National Defence Force) came with the declaration of World War 1 during the German South West Africa (Now Namibia) Campaign. The Historical event took place at Trekkoppies, with the successful use of LIGHT armoured cars of the Royal navy Armour Car Division under the command of Lt Cdr W. Whittall against the German Army. At the end of World War 1 in 1918, the then Union Defence Force (which became the South African Defence Force which is now a part of the South Africa National Defence Force) did not possess any armoured vehicles. 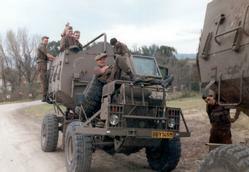 Due to limited defence requirements, as well as an inadequate defence budget, no effort was made to integrate armoured cars as part of the military organisation. The appearance of the Tank during World War 1 in Europe awakened interest and the Union Government acquired a single Whippet Tank. A Vickers Tank was acquired during 1923 and in 1924 the Union General Staff considered the founding of an Armoured Corps. 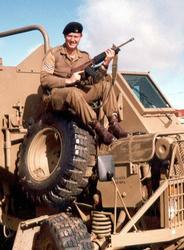 Later the same year the first Armoured car Section was founded and accommodated at the Military College. During 1925 two Crossley armoured cars were imported from Britain for training purposes. A Training Section was then established at the Military College. At the onset of World War 2, on the 6th September 1939. 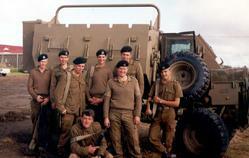 The Union's Complete Armour force consisted of only two Crossley Armoured Cars, 1 Whippet Tank. 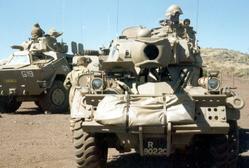 At the start of World War 2 the production of Armoured Cars was initiated. 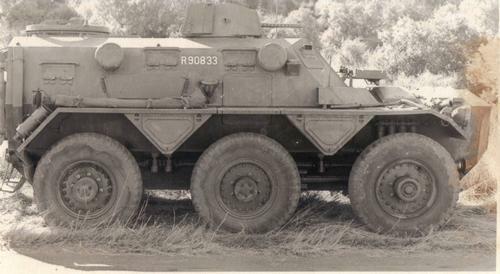 South Africa’s contribution to the armament industry was the construction of the Marmon-Herrington Armoured Cars which bore the brunt of the medium reconnaissance work in the Western Desert, with the 11th Hussars, SA Armoured Corps and the 4th SA Armoured car Regiment. 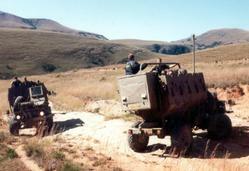 No fewer than 4566 of these four wheel drive V8 powered machines were delivered to the Union Defence Force. 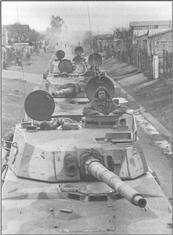 The Special Service Battalion was converted to an Armoured Car Regiment at the start of the Second World War and the South African Tank Corps with its HQ at Roberts Heights (Thaba Tshwane) which was established in May 1940. Army Training Instruction 7/59 authorized the SAAC colours as Orange (BS557 [Light Orange]) over Blue (BS104 [Azure Blue]). Any Regimental Numbering, Tactical Call Signs and Other Indicators are to be brought on in Silver. 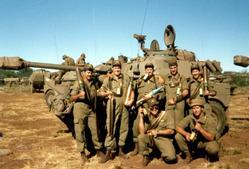 The army started using Stable Belts in 1983 and the SAAC adopted the colours of the Beret Flash for the Belt. On the 24th of July 1996 the Chief of the SANDF approved the colours and the Flag for the SAAC as Orange over Blue divided by Silver/White. During the early 2000, the SAAC lost its colours, flag and stable belt as it was interpreted by some people in and outside the SANDF as offensive and as a representative of the previous political dispensation and regime. During 2003/4 this somewhat uneasy situation urged the SA Army Armour Formation leaders to change the appearance of the flag. Although new colours like Black with Orange or Black with Silver was considered, it was eventually decided not to change the colours but to reconfigure the colours so that it would not be confused with the old flag. The new flag (Colours) has a blue background with a mailed fist in white with orange finishing touches. On the creation of the SAAC (first as a citizen Force Unit and later as a Permanent Force Unit) the corps used the National Flower “PROTEA” as the symbol. 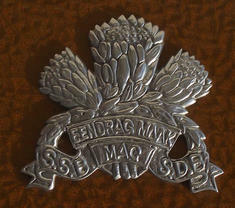 This was the Badge of the Special Service Battalion. From establishment all SAAC Permanent Force members, except recruits wore the chromium plated white metal badge of the Special Service Battalion, this badge was worn until 1963. In 1963 the Special Service Battalion badge was adapted for use by the SAAC and the letters SSB/SDB were replaced with the letters SAAC/SAPK. 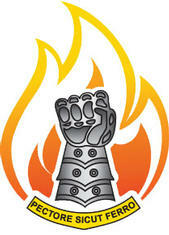 On its 50th Anniversary in 1996 the SAAC officially adopted the mailed fist emblem with a Protea as the corps symbol to clearly distinguish it from the SSB emblem adopted and used since 1946. Through political changes in 1948 and 1994, the colours and symbols of the SAAC have been retained and to date these colours distinguish the SAAC, which loyally served various governments with distinction. 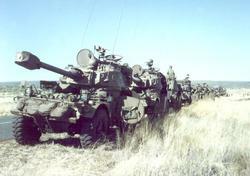 The South African Armoured Corps is known for its professional and dedicated soldiers who proudly serve their country under the traditional corps symbols and colours.